Navman S50 3D with pixel-perfect 4.3-inch widescreen is preloaded with the latest maps of UK and Ireland and features full 8-digit UK postcode search and improved address search. The Navman S50 3D also includes integrated Bluetooth module for safe handsfree calling and New Navman Desktop Manager including Mileage Reporter. The Navman S50 3D intelligent day/night display makes the S50 3D even easier on the eyes. Navman S50 3D also includes free trial to Navman Safety Camera Data. The Navman S50 3D optional T2 traffic cradle provides real-time route traffic information for your whole route, complete with any hold-ups on the road ahead. Navman S50 3D has been discontinued. Accessories, spares and parts are still available for your S50 3D. The Navman S50 3D satellite navigation system features a brilliant, sharp 4.3-inch colour widescreen touch screen display, integrated Bluetooth module, points of interest, speed cameras and intelligent day/night display. The Navman S50 3D is preloaded with the latest maps of UK and Ireland and features turn by turn navigation with voice guided instructions and a full 8-digit UK postcode searches with 2D and 3D moving map display. 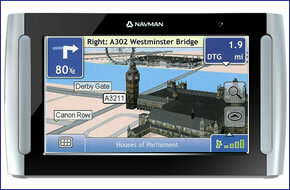 Plus, with the Navman S50 3D, you can navigate via images with 'NavPix'. The Navman S50 3D allows for Bluetooth connectivity with compatible mobile phones. Make and receive calls safely and legally while driving - incoming calls are not interrupted by navigation directions and the caller's name is displayed on the screen. Your phone's address book synchronises automatically every time you connect, and if you share your Navman S50 3D, multiple pairing allows you to connect up to 5 different phones. A NavPix photo carries its exact location data, which your Navman uses to navigate to - handy if you don't have the address or postcode of famous places you would like to visit. For example, who knows the exact address of the Eiffel Tower, the Tower of London or the Brandenburg Gate? By combining images with geo-referencing, NavPix lets you use images, such as the Eiffel Tower, as points of interest (POIs). You can then use those NavPix images when planning routes on your Navman S50 3D. The Navman S50 3D is pre-loaded with a free trial of the Navman UK speed camera database. The latest safety camera data is fully integrated with the Navman S50 3D. Colour coded speed camera icons are displayed on the Navman S50 3D so you can easily recognise the type of speed camera on your route. You can also select your proximity range allowing you to decide when you should be alerted of an approaching speed camera. The Navman S50 3D has been designed to be Plug and Play, and as such can be transferred from vehicle to vehicle with ease by the user. The Navman S50 3D is powered with a 12-volt adaptor cable in-car (supplied) and attaches to your vehicles windscreen via the Navman S50 3D suction mounting bracket which is also included. Also available the optional T2 Traffc Cradle provides subscription-free real-time traffic updates available in 13 European countries including the UK, requires additonal mapping for use outside the United Kingdom. View the Navman T2 Traffic Cradle. The Navman S50 3D includes speed camera locations pre-loaded. Subscribe to monthly updates of speed camera locations for the United Kingdom. Subscription to the Navman UK speed camera database is priced at £34.95 for 1year or £69.90 for 3 years. The Navman S50 3D is complete with the latest Navman 2007.4 TeleAtlas maps providing detailed street level maps of the United Kingdom: 98 - 100% and Republic of Ireland: 95 - 100% coverage. House number information in the United Kingdom: 98 - 100% (GBR and Belfast) and Republic of Ireland: 70% representing a huge improvement on previous mapping data. Although the Navman S50 3D has been discontinued, a number of accessories are still available to buy from ActiveGPS. These accessories and spares include: leather carry case, vehicle charger and T2 traffic cradle. Question: IIhave a NAVMAN S50 3D device that I understand is no longer supported by Mio. Is there any third party support available for map updating? Also, with the Traffic Cradle on offer, can it be attached to the standard suction cup fitting and, in relation to the S50 should the aerial be located? Answer: We have no knowledge of any third party maps for the Navman S50 3D. If you did find any they would probably overwrite the operating system and change the display on screen. The T2 does attach to the original Navman suction cup mount. The T2 comes with an external antenna but, depending upon your vehicle power cable, the mini USB connection may prevent insertion of the antenna jack plug. If you buy the correct cable this includes a built in antenna in the vehicle power cable. We also include a T2 with this purchase. However, you will need to know that your Navman S50 3D is capable of decoding the TMC signal. If not, you will not receive the Traffic Messaging Channel. Do you have a question about the Navman S50 3D? Submit your question via our contact page.